On Sunday 31st October Ron Williamson was Ordained a Permanent Deacon whilst on retreat in Nympsfield, Gloucestershire. Ron has been an acolyte and reader at the Parish of St. Francis for the past four years, he has been a great help to the parish in many ways, and supportive of both Bishop Martyn and Fr. Tony during this time. Ron was born in 1953 in Falkirk, Scotland, and brought up there. Although his parents have now passed away, Ron has three brothers and three sisters with whom he still keeps in touch. Ron was brought up as a protestant in the Church of Scotland; he was taught in the local primary and secondary schools, and left school at 15. In 1975 Ron moved South to England, and lived and worked in Nottingham and then in Oxford. Ron came to Southampton in 2001. 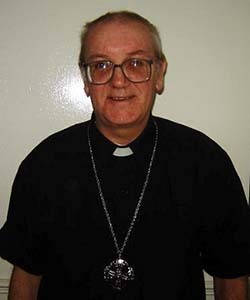 Ron met Bishop Martyn in 2006 through Terry Merrifield, when he was invited to Terry's Ordination. It was in 2007 when Ron started to attend Mass regularly and became a valued member of the family of St. Francis. Ron soon volunteered to read at Mass and also trained as an Acolyte. Since being part of St. Francis and TESSAC, Ron says that he has met a lot of good kind people, who have helped and supported him at the church, for which he is very grateful and offers his thanks to them all.